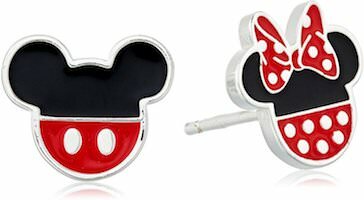 If you are a big fan of Mickey and Minnie then you really look at these fun Mickey and Minnie earrings. The earrings are made from sterling silver and have an enamel finish. Each earrings is different as on is Mickey Mouse and the other Minnie Mouse and they just shows the head and the colors and that will look stunning in your ears. And these Disney earrings also come in a fun Mickey and Friends gift box so that you can give these amazing earrings as a gift to the true fan of Mickey Mouse and Minnie Mouse in your life.